Yet More Classes for Pathfinder Lite! The last months flew by. One week and a half ago this blog made one year (and this is its 200th post). I didn’t expect to reach both marks. First, because I my English is simply awful and I didn’t knew if I had enough practice to keep a blog (and yeah, I’m aware that I’m still far from good). Second, I feared I’d quickly lose my interest, forgetting to keep this Tower properly updated. To my surprise, not only new ideas for posts came with relative easy, but I also greatly enjoyed what become like a second hobby for me. Moving out of town and losing touch with most of my friends (and game groups) really changed my weekly tasks of posting in the Tower to something almost therapeutically. Now I’m finally getting used to my life in Belo Horizonte – including a new game group (and, if I had more time, maybe two) and a meeting point with local gamers. Ironically, I noted that these two elements (plus my old group, for whom I still run a game every two or three months) are taking a considerable portion of my free time and thus making this blog harder to maintain. I don’t want this to happen, as I believe that now I own lots of hours of enjoyment to this inconspicuous Tower. 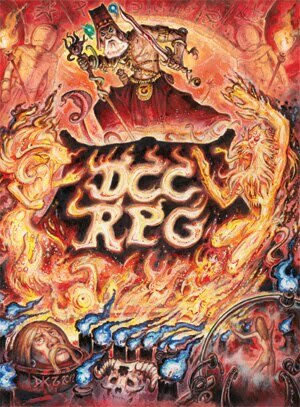 So, while this post isn’t as good as the one about Vancian magic, I hope you like this Lite versions of the remaining Core Rulebook classes. 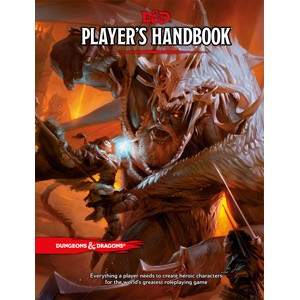 I may try in the future to do the same with the new base classes from the Advanced Player’s Guide, Ultimate Magic and Ultimate Combat. And talking about Pathfinder Lite, I’m very curious about the small alterations and simplifications done to the Pathfinder Beginner Box and I’ll try to get a copy of it in the next months. The Bard is a more complex class and too front-loaded for a Pathfinder Lite game in my opinion; because of this you’ll note that I removed the first Feat. The above build reinforces the Bard’s support role (Extra Performance) and strengths the idea that Bardic magic is more about voice than intricate hand gestures (Still Spell). I was really tempted to simplify Bardic Performance in a more radical sense, chancing this class feature to a basic “anti-magic” defense. It would be less versatile and subtle, but easier to use for beginners. If you want to give it a try, remove Countersong, Distraction, Fascinate and Inspire Competence +2. Replace these with a new Bardic Performance called Spellbane: At 1st level, a bard learns to counter spells with his performances. Each round of spellbane the bard must make a Perform (keyboard, percussion, wind, string, or sing) skill check. Any target within 30 feet of the bard that attempts to cast a spell with verbal components must succeed at a Concentration check (DC is the bard’s Perform check result for the round). If a creature within this area is keeping a spell with a duration of Concentration, then he also must make a Concentration check every round. Spellbane requires that the bard spends a move-action every round to maintain it (the bard must also roll a new Performance check at the beginning of his turn). Spellbane affects a number of targets within sight equal to the bard’s level. At the beginning of his turn, a bard can change targets. Spellbane relies on audible components. Ok, some major changes here. The new class feature Monk Unarmed Style was created for my home games in the 3.5 edition to remove the class’s dependency on multiple Ability Scores. Monk Unarmed Style: The monk gains all the benefits of the old Unarmed Strike class feature. He also uses his total monk class level as his base attack bonus for the purpose of determining CMB and CMD. Finally he can use his Dexterity modifiers for melee attack rolls and his Wisdom modifier for damage rolls when using weapons for which the monk class is proficient (including Unarmed Strike).This new class feature substitutes the 1st and 2nd level Bonus Feats, Unarmed Strike and Maneuver Training. I picked Improved Grapple, Deflect Arrows and Blind Fight as Feats. I believe that, together, they form a good “iconic monk” suit of abilities. Finally, I placed Ki Pool (Magic) at 5th level – sort of a benchmark feature. To compensate for this, I let monks choose among two Ability Scores at 4th. I removed the paladin’s spells, in part to keep the class simple, besides reinforcing its aspect as a “holy knight” instead of a “martial priest” (already taken by the cleric). Divine Bond is too much to bother with. I replaced it with Divine Guard: the paladin can, a swift action, spent one use Channel Positive Energy to have protection against evil cast on himself. Use his paladin class level as caster level. I never liked of “virtual feats”, so I removed Combat Style and replaced it with Bonus Feats. Instead of choosing among different weapon styles I transformed the ranger in a scout. So now he gains Mobility and Spring Attack as Bonus Feats. Run and Nimble Moves supplement this. Catch Off-Guard is just to reinforce an idea of mine – I like the concept of the experienced ranger who can use broken weapons (or really anything at hands) as something lethal. Hunter’s Guidance is just a fanciful name for Hunter’s Bond (Companions). Let’s leave Animal Companion as an iconic ability of the druid. Again, I removed spellcasting but added a 2nd Favored Terrain at 5th level. I removed Bloodlines. While I understand that they’re awesome and so, I don’t want to complicate things. Sorcerers here are – reputedly – descendants from dragons, gods and other eldritch things. They’re also magic mavericks. I replaced Bloodline’s powers with Eldritch Aura, Eldritch Sustenance, Energy Resistance and Dispel Magic. Eldritch Aura (Su): as a sorcerer you always summon greater amounts of eldritch power. After casting any spell you can chose, as a free action, to be surrounded by a magical aura (it emits light like a torch). Eldritch Aura remains in effect for 1 round, plus an extra round per spell level. Each round, again as a free action, you must chose one of the following benefits – +1 bonus to AC/CMD; +1 to saves against spells (and spell-like abilities) or the ability to make touch attacks that deals 1d4 points of damage. These bonus increases to +2 at 4th level (and the touch attack to 1d6). Eldritch Sustenance (Su): as a full-round action you can spend one spell slot of 1st level or higher to nourish yourself (you don’t require food and water for 1 day). Dispel Magic 1/day as a spell-like ability. Unfortunately I don’t run as much Call of Cthulhu as I would like. To counterbalance, I tend to introduce the Mythos (even just a quotation) in practically every RPG that I run (I haven’t tried it yet with Star Wars but I have some ideas about Korriban...). Anyway, the The Red Eye of Azathoth seemed to me the perfect opportunity for correcting this inexcusable negligence. This augury is based on the PDF version of this product. The Red Eye of Azathoth seems to me to be the perfect opportunity for correcting this inexcusable negligence. This is a 108 pages bookmarked e-book with five interlinked scenarios for BRP Call of Cthulhu. The interior art is B&W, and while isn’t eye-catching, it isn’t bad. The layout is good and the pages are colored to look like a scroll or old book. 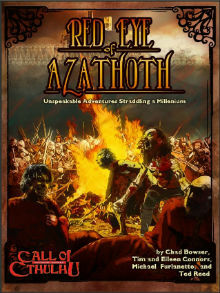 The Red Eye of Azathoth’s scenarios are not stand-alone (theoretically nothing can stop a Keeper from running each adventure alone, but you’d lose half the fun) but part of campaign that places the Investigators against an ancient Chinese sorcerer bent on summoning Azathoth, the Daemon Sultan, on Earth. Each scenario takes place in a different place and time, with the players roleplaying the reincarnations of their Investigators. It’s a great idea and the authors pull it out admirably. The first scenario – That Which Is Dead Shall Refuse To Lie – starts in media res, placing the Investigators against thunder and blood (literally) by recreating the classic Viking raid of 793 in the Lindisfarne monastery and spicing it up with Mythos elements. The scenario is a nasty Sanity-drain sequence, full of disturbing vistas, giving little time for the players to think. However, what really makes That Which Is Dead Shall Refuse To Lie stand out is the rushing opening and the fact that the Investigators are divided among Viking raiders and Christian monks. These two elements, coupled with the flashbacks and the chaotic progression (besides the lack, at this point, of any clear explanations) build up a strong plot and it’s a terrific start for a Cthulhu (or any other RPG) campaign. The second scenario – The Silent Of Thousands Shall Quell The Refrain – takes place in 1287 AD, Japan. The Investigators play samurai sent by the bakufu to investigate the peculiar circumstances of an isolated (and very prosperous) village. At the first scenes the group becomes aware of supernatural presences, which set off new flashbacks, bringing back memories (and skills) from their previous Viking characters. The twist to this second story is the discovery that the Investigators face not one but two mutually opposing forces. The focus of the scenario – the peasant village – is full of idiosyncrasies, the most blatant being that all its population is mute. From a roleplaying perspective this is most challenging element for the Keeper and it’s a pity that this isn’t further explored (a few examples of the local pictographic language would’ve being nice). By now it’s already possible to pinpoint an aspect of The Red Eye of Azathoth – its scenarios are intense, quick-paced and direct. This is in my opinion a good change from traditional Cthulhu adventures – where a great portion of the game is dedicated to carefully collect clues and evidences. While the first two scenarios do provide clues, they use them to move the plot forward (and as flavor), instead of hidden crucial elements necessary to the story’s progression, which is a perfect design approach – groups that love minutiae still will have plenty of information to uncover, while groups who enjoy action can ignore those details without missing the dramatic conclusion. The third scenario – Fires Of Hate Defile The Sky – happens in Valencia, 1478, and deals with the Spanish Inquisition. Like all the previous ones, this tale starts with a bang! (and a painful one as opening scene is the torture of one of the Investigators). Instead of degenerating to simple gore, the authors provide a clever and metagame element to the scene. The rest of the scenarios deals with the revelation of the investigator’s past lives, their escape from the dungeons and through the streets of Valencia (using a nice variant of Pathfinder Chase rules). And because this is an Inquisition’s story its climax must – for dramatic reasons – be an auto-de-fé. The fourth scenario – Lost Shall Be Those Bearing Souls Split In Twain – takes the Investigators to the (in)famous Roanoke colony, in the New World, 1578. This information alone will probably set the most History-minded players’ attention on fire. This scenario is probably the most traditional of The Red Eye of Azathoth. We have here all the classic elements of a Cthulhu story, inclining the slow-building tension produced by the uncovering of clues. Ironically, the adventure is demanding on part of Keeper, especially at the first scenes (before the journey to the New World) and at the interaction with Roanoke’s NPCs (both Englishmen and natives). However, in many ways Lost Shall Be Those Bearing Souls Split In Twain can also be an unique experience – the reincarnation mechanics allows the players, in a way, to effectively use elements of the previous adventures. If not for this one aspect, this adventure would probably the lowest point of the anthology. And Madness Shall Rise To Devour The West, the fifth and last scenario starts with one of must Sanity devastating (and awesome) scenes for any RPG – the Investigator awaken amnesic in dead hanging bodies in Desperation, Arizona, 1887. This is the final showdown between the group and the Mythos forces seeking to summon Azathoth. The Investigators aren’t truly undead, just raised from the dead. However, for the next 24 hours (while their bodies regenerate) they have a few zombie-like advantages. A portion of this scenarios is consumed with the group tracking their personal lives (the last incarnation at least). The main goal is to discover the Mythos activity below town and to brave the “dungeon” on the mine tunnels below Desperation (by now this element becomes a little obvious as two scenarios already ended underground). Like the previous adventure, And Madness Shall Rise To Devour The West has an open-ended structure. The twist here is not that the players must navigate their characters through a community driven on the brink of madness through cannibalism, but they must roleplay Investigator returned from the dead – again a unique roleplay opportunity. The Red Eye of Azathoth has new monsters, spells, artifacts and even new skills and rules (like Fanning, for the Wild West scenario). This anthology is different from anything I’ve read so far for Call of Cthulhu. It has a great pulp vibe to its attitude and style of game, with scenarios loaded with action and dark dramatic rituals. I believe it can be a good introduction for experienced players interested in playing Chaosium’s Call of Cthulhu. I’m sure that even my dungeoneering players would enjoy this karmic roller-coaster. The adventurers from the Hammers of the Dawn rested and healed their wounds until late afternoon, when they’re summoned by Road Marshal Garamus. Although he had recently exiled his most loyal advisor – the Warbard Mellius – and recovered from a deadly wound, Garamus was in a very good mood. Together at the room were the members of the Lunatics – an adventurer group composed by Mask, their masked and hooded leader (supposedly a half-elf sorcerer), the human duelist Axar Weapon-Master, the masked technomage Zin and the taciturn half-orc Karanuk Shadowslayer. When the Hammers came in the Lunatics were standing at one of the room’s corners, and it appears that the Road Marshal was admonishing them for some recent failure. Garamus received the group personally, swearing by the dead god Mitra’el of the Twin Suns that the Hammers were his most competent adventurer group at the Eye. To everybody’s surprise, Garamus was promptly punched in the face by the elf Heian. The strength of the hit sent the Road Marshal over the council table. The Hammers didn’t knew that Heian had consulted a halfling diviner back at Baer’s Tower and had listened to the following augury – “Smite the face of the first man that invoke the dead gods’ name before you”. While Hilguen was starting to reprehend the fey wizard, the remaining Hammers saw that Garamus’ face was not bleeding but cracked – like a masquerade. The glamour quickly left the figure of the Marshal, revealing the half-elf Mask (while this happened, the “second” Mask at the room simply faded away). Their deceit undone, the Lunatics assaulted without delay assaulted the Hammers with blade, spell and bombs; but this small element of surprise wasn’t enough and the traitor adventurers were soon on the defensive (a curious fact was that Kanaruk also faded at the beginning of the combat, revealing a second illusion). Seeing the tide turn, Mask summoned “the power of Shzamias, the Potent, Fifth Satrap of the Airy Tower!”. This invocation shook the entire room. Through the double doors and the widows the Hammers saw a magic (and impossible) hurricane isolating them from the rest of the Eye. In fact, it seemed that the entire council room was pulled from the lighthouse. The magical winds didn’t help the Lunatics, with Zin and Mask himself saved only because they’re healed by the touch of the maiden-priestess Dricia. Mercy, however, didn’t stop Mask from summoning again the power of the mysterious Shzamias. This time, though, the spell failed and the mad sorcerer was consumed by lightning and disappeared. After the chaotic skirmish, the Hammers started to investigate their surroundings. The entire room of the war council was floating (intact) inside a bizarre dimension made solely of storms and cyclonic winds. Hilguen (an aasimar) pointed that group was probably trapped in the Elemental Plane of Air. The quickly searched the Lunatic’s pockets for any trinket that could take them out of there. Finally, Heian found a magic ring that, when touched, opened a gate at the room’s center. Axar and Zin – now prisoners – revealed that, together with Mask and Karanuk, they’re survivor from other three adventurer parties that sought for the mythic City of the Immortals in the jungles of Shinmarash, itself a fabled nation of Eastern Aldar. Axar was the last member of the Seven Rings, from Dol Moldhar; Zin belonged to the Iron Chimeras, from XII Imperial Legion; while Mask was from the Scarlet Cowled Ones. They didn’t knew from which group Kanaruk came. In their ill attempt quest for the City of the Immortals, the ended lost in the Dragon Throne Mountains, being eventually captured by the genies of the Elemental Courts, whose hidden kingdoms were said to be inside those hollowed mountains. The mates of Axar, Zin, Mask and Kanaruk were all killed, devoured, banished, cursed and polymorphed (usually in furnishing) by the genies’ twisted games. Desperate, the four fools appeal to the local noble djinn’s mercy – Shzamias. Mask suggested that “it would be more fun” to let them escape. When inquired about the reasons for such, Mask explained that he swear to search other “lunatics”, like himself, and bring them, as new toys for the genies. Entertained by the half-elf’s proposal, Shzamias set them loose, under a geas, creating the Lunatics that the Hammers met at Baer’s Tower. Since then, the Lunatics have wandered through Aldar, creating havoc and occasionally abducting other poor adventurers to their genie lords. Axar and Zin told that if they ever returned to Shzamias’ domains, they’d be killed (or worse, like being polymorphed into sanitary utensils). Both assured the Hammers that the gate leaded to the djinn’s hollowed realm. The ring was, in fact, a “present” from Shzamias to Mask. After much debate, the Hammers decided that even a mad genie satrap was a better option than stand forever floating in a lost room inside the Elemental Plane of Air. They thought about gaining an audience with “the Potent” Shzamias. They also intent in rescuing the true Road Marshal, the Warbard Mellius and the half-orc Karanuk, because it was clear now where they were – in the Elemental Courts below the Dragon Throne Mountains, half a moon away. The Grey Box is awesome! I’m slowly reading the Forgotten Realms “Grey Box” Edition and I’m astonished by the small insights that this experience has given me. I discovered Forgotten Realms at the middle of the 2nd Edition (and my favorite products are usually from the end of this period), so reading this box is – in way – a fresh look on the Realms for me. Not only it gives me a sense of freedom about how to use Faerun in my games, but also rings true (instead of the horrible and poorly explained chaos of the 4th Edition version of the setting). AT A GLANCE: Mulhorand is one of the great and ancient nations of the South, of which little truth and much rumor is known. It is situated at the far end of the Sea of Fallen Stars, in the region known as the Sahuagin Sea. ELMINSTER’S NOTES: Mulhorand is said to ruled by a dynasty of beautiful and undying kings and queens, who wield godlike powers. It is also home of the Statues That Walk, great juggernauts which dot the landscape and on occasion, for unknown purposes, animate and wreak havoc. Mulhorand is the oldest of the known nations of Faerun. The “Grey Box” is full of material like this. 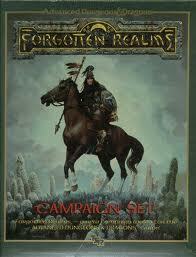 Very engaging and perfect for exploration and sandbox campaigns. Some months ago I wrote what I called my Pathfinder Lite – a small hack of the Core Rulebook to allow an easier game experience for beginners (or for old Gamemasters like me that want less complexity but also love Paizo’s material). Basically, I integrated skills into each class (like Castles & Crusades) and pre-selected feats for the first 5 levels of the Cleric, Fighter, Rogue and Wizard classes. The original idea was to introduce this version of Pathfinder to my cousin and his friends (they had played only Swords & Wizardry so far) as an entry-level game. Unfortunately, that never happened. (Blasted online computer games!) However, it didn’t stop me from tinkering with Pathfinder Lite. Here are two more classes for it. All the choices below were made in an attempt to reinforce the classical vision of each core class (my vision at least). If you have any doubts, please check the original article (or ask me!). Note that Barbarians don’t gain Rage Powers. I just don’t like them and traded both Rage Powers (at 2nd and 4th) for the Self Sufficient feat at 2nd. As most rage powers are roughly equal to a “half feat”, that should do it. Druids are hard to balance, as they’re already a terrific class, so I placed Wild Shape at 5th level as benchmark power (but I let them choose where their +2 Ability Score bonus goes at 4th). Animal Companion: let’s simplify this. Your Animal Companion is a common medium animal (a wolf, a small lion or bear, a giant lizard etc.). It has HD and saves equal to the Druid. It has AC 14 (+2 Dex, +2 natural), which the natural armor bonus increasing to +4 at 4th level. Its BAB and CMB are equal to the Druid’s level + 2, its CMD equals its CMB + 2; it has one natural attack that deals 1d8 + 2 points of damage. At 3rd level it either increases the damage to +4 or add trip. The Animal Companion HPs are equal to Druid’s +4. At 5th level, it gains Evasion. Forget tricks, link, share spells etc. The Druid orders and the Animal Companions follow. Simple as that. Leave Handle Animal checks to trained normal animals. The Animal Companion has the same skill bonus as the Druid for tasks that the Gamemaster deems thematic with it. This new spell started as another Weird Arcana entry, turning midway to something different: a mix between a dweomer and a trap. Pathfinder treats magic as an (arcane) science, so one can argue that many spells which were created in the past were later made obsolete; or that some dweomers are simply dangerous (or the result of yours traditional Mad Archmage©). The idea is to both surprise the players and also to give back that indescribable aura of allure and danger that surrounds magic (or at least should surround). Please, note that the spell’s description is a little “old school” in approach (I don’t treat blue inebriation as a “normal” curse in Pathfinder terms). The dweomer’s description is divided. The first part is “open” and can be discovered by a spellcaster by the normal rules. The “hidden effect” parts require either an NPC to inform the player character or a successful Knowledge (Arcana) check. 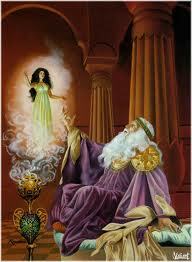 Sorcerer can’t learn beckon the blue servant as a known spell, but can cast it normally from magic items like scrolls. Unseen servant is probably a modern (and safer) version of this spell. Effect: One weird blue-skinned dwarf-like servant. This odd and archaic dweomer summons a blue naked hairless and sexless dwarf. Old arcane lore implies that this creature is an old dwarven king or demigod, forever cursed to perform the rotes of beckon the blue servant. The Blue Dwarf will – at the command of the caster – summon a magical banquet, including an ancient blue wooden table, chairs and tableware, with at least one alcoholic beverage and weird fresh fruits, both unidentifiable. It will not leave the immediate area where it was summoned and attempts to remove or attack it will cancel the dweomer. The dwarf doesn’t talk and understand any tongue spoken by the caster. All objects summoned by the dwarf will disappear once the spell’s duration ends or if the servant is attacked. The Blue Dwarf creates enough food to feed one medium creature per caster level. All those that partake of the entire banquet will gain 1 hit point per level, recover any nonlethal damage from lack of food or water, and remove the fatigued and exhausted conditions. Hidden Effect (Knowledge Arcana DC 25): One randomly chosen attendant gains a +2 enhancement bonus to Constitution and the ability to reroll any attack roll, save throw, ability or skill check for the next 24 hours. Another attendant (also chosen randomly) is cursed with blue inebriation for the next 24 hours (SR applies against this). A target with blue inebriation suffers a -4 penalty to Dexterity and gains the confused condition for 1 round the first time he suffers damage in any encounter. Hidden Effect (Knowledge Arcana DC 30): The second time beckon the blue servant is cast within the next seven days, the Blue Dwarf will appear slightly bigger, with fangs and shinning red eyes. It’ll chuckle while the attendants eat, as if the summoned food was poisoned. The food is fine, but looks rotten and has an acidic taste. 3. The Blue Dwarf will possess the caster (allow a Will save and SR normally). If successful, it can spend spell slots to spontaneously cast elementals to attack the party (like a summon monster spell of the same level). 4. The entire party is teleported to the original dwarven realm of the Blue Dwarf, probably in some forlorn location in the Realms Below. If after this event the caster is stupid enough to cast this dweomer a fourth time within the same week, he simply disappears. The next time any member of the party see this spell being cast, instead of the Blue Dwarf they’ll see their lost friend as a crying, blind and tongueless servant. After that, he’s never seeing again (only wish or miracle can bring the poor fool back). *New spell component: Time. Beckon the blue servant can only be cast at night or in the underground. Five out of four of my players choose bonded object as their Arcane Bond option. The only player that summons a familiar does so because he likes to roleplay with his talking crow. He doesn’t care for the mechanical benefits and, in fact, can’t even remember most of them during play. 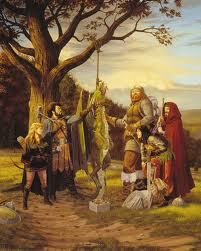 Such is the issue with familiars in D&D (which has a long tradition as this instructive tale reminds us). Familiars should be fun and easy to use, besides presenting a clear mechanical benefit for spellcasters. They also should add a layer of mystery and potential roleplay for Gamemasters and players that like to explore this theme. 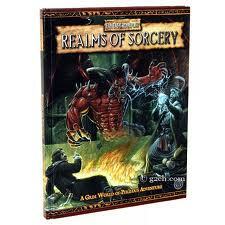 At least when talking about rules, my favorite ones so far is Warhammer 2nd Realms of Sorcery. I suppose there’re good variant rules for familiars in D&D out there. The simpler option (besides removing familiars from the game) that I know comes from Trailblazer. D&D 4th Edition presents a much more useful familiar, but is unfortunately restricted to the grid-based system of that edition. In my Chronicles of the Seventh Moon campaign I boosted familiars by adding new powers and options to their progression; however, they still aren’t popular with my groups and I admit that the extra bookkeeping of my house rules doesn’t pay off (i.e. the “fun factor” remains the same). My favorite take on familiars from fiction comes from Clark Ashton Smith’s short stories, like "The Last Incantation" (probably one of the best). In the Forgotten Bard’s tales familiars are outsider spirits with strange agendas and minds, summoned to assist their spellcaster masters. It doesn’t matter which form a familiar takes, they’re always mysterious and not entirely trustable – they’re aliens beings; useful for sure, but whose ultimate motivations are unfathomable. With that theme in mind, how to turn this into something worthwhile from a mechanical perspective? I suggest taking a look at the Arcane Bond (Bonded Object) feature first. A bonded object – basically – works as a masterwork item that can be enchanted without item creation feats and that can be used, once per day, to cast any spell that the wizard can prepare from his spellbook. It has all the limitations of a physical object (hit point, hardness etc). It’s also important to note that without his bonded object a wizard must roll a Concentration check to cast any spell. Let’s forget the normal familiar rules for a second. With bonded object as our sole reference, how a CAS Familiar – let’s call it a Servant – would work? A Servant is an outsider spirit, summoned from strange planes and weird dimensions, through an old ritual that lies at the foundation of the wizardry tradition. 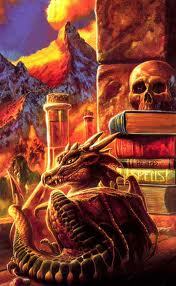 Some believe that the first Servants thought wizardry to lesser sorcerers and sages, eons ago. Once summoned, a Servant tailors a temporary body for himself, usually mirroring a minor local lifeform. If this form is destroyed, the Servant is only sent back to its natural dimension, without any lasting consequences (maybe a little annoyed or offended). In many ways, this ‘materialization’ executed by Servants work as a reversed astral projection. Mechanically speaking, Servants are small or tiny outsiders with a number of Hit Points equal to their master’s HPs. For rules’ sake their HD and BAB are equal to their master’s caster level (CL). Their AC is equal to 10 + ½ master’s CL + master’s Int modifier. Servants have the same save bonus of their master. A Servant deal 1d4 of physical damage that counts as a magic weapon for the purpose of DR/magic. Servants have SR equal to 11 + their master’s CL. All Servants are considered to possess Escape Artist, Perception and Stealth skills with a total bonus equal to their master’s CL + their Int mod +3. All other skills have a total bonus of +0. While within 5 feet of their master, Servants are treated as normal animals for the purpose of effects that target and affect outsider (divination magic can’t reveal their true nature). Anything a Servant touches is considered to be touched by his master (including touch spells that were not discharged). A master can see and hear everything that his Servant see or hears by concentrating (using a full-round action that provokes attacks of opportunity); while doing this the master can’t use his own senses and is considered helpless. Servants possess darkvision 60 ft., doesn’t need to eat, sleep or rest. A Servant retains its material form if within 1 mile of their master. Out of this range it’s instantly banished. At every five levels, this range is increased by 1 mile. A Servant’s advices and accumulated arcana are always helpful, although it’s clear that either the Servant doesn’t fully comprehend the subject or is holding something back. In game terms, these sporadic advices grant a +2 bonus to Knowledge and Spellcraft checks (it allows the master to treat all Knowledge checks as if he was trained). The master also develops a strong animal affinity with his Servant. An owl Servant could grant better vision, while a snake Servant could contortionist abilities. The master gains Skill Focus with one physical-based skill, as a bonus feat. At 5th level, the Servant helps protect its master if within 5 feet of him. The outsider can, once per day, do a counterspell against any dweomer that includes its master in the area of effect or among its targets (in game terms treat this counterspell as a dispel magic cast by the master, as an immediate action). At 8th level, the Servant’s occasional insights allow their master to “take 20” with any Knowledge, Spellcraft or Use Magic Device check, once per day, without the usual time dilations or skill limitations. At 11th level, if within 5 feet of its master, the Servant grants a +2 bonus to caster level checks (for example, when using dispel magic or attempting to bypass SR). At 14th level, if within 5 feet of its master, the Servant protects his master from one spell, spell-like or supernatural effect. The effect must be susceptible to SR. Treat the effect as if it automatically failed to pass the master’s SR. The Price: Servants demands something from its master. A Servant inflicts a constant -2 penalty to a Wizard’s Wisdom score (affecting skills and Will saving throws). The wizard also gains one physical and obvious animal trait from the Servant (like cat’s eyes or a tail) or a strange animal habit (this one resulting in a -2 to Diplomacy and Sense Motive checks). Servants are untrustworthy. In game terms, the GM makes a secret Will save for the wizard each day (the DC is 10 + the wizard’s CL + the wizard’s Int mod). If a failure occurs, the Servant will refuse to execute one order that day and will dissipate for the next 1d4 hours. If the GM agrees, special (and constant) sacrifices or obeying the weird demands from the Servant can stop the bizarre behavior. Banished Servants: If a Servant is banished, the master is automatically exhausted and must realize a special ritual that costs 300 gp per wizard level and deals 1d6 points of Constitution damage (that must be healed naturally) to summon it back. You can temporarily dismiss your Servant (an action that requires one minute) and summon it back by offering a pinch of your blood (1 HP). The Servant will materialize within 1 mile of your in the next hour and move in your direction. That's all folks... until Monday!